A 21 year old female underwent a left oophorectomy after presenting clinically with a left ovarian pelvic mass. The gross specimen was fibromembranous tissue aggregating a mass of 4.5x4.5x2.2 centimeters and weighing 6.0 grams. Hair was grossly discernable. Fragments of bone-like structures measuring up to 1.5 centimeters were also noted. Microscopic examination revealed a benign left ovarian mature cystic teratoma demonstrating a small benign blue cell nevus. There was focal reactive interstitial stromal collagenized fibrosis (scarring) and focul granulomatous multinucleated histiocytic foreign body type giant cell reaction to focal entrapped embedded hair shafts and to very focal extravasated keratin. This case is a garden variety mature cystic teratoma ("dermoid cyst") of the left ovary except for the very rare phenomenon of the development of a second benign neoplasm arising in the benign germ cell tumor (mature cystic teratoma). 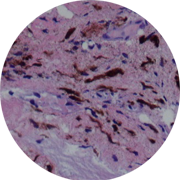 Histologically, the blue nevus demonstrated heavily melanin pigmented benign spindle/dendritic melanocytes arising in the cutaneous ectodermal component of the ovarian mature cystic teratoma. The ultrastructural findings of two cases of "blue nevus" in ovarian benign cystic teratomas were described in 1985. The bipolar or dendritic pigmented cells showed features of Schwann cells with melanin synthesis, but not of ordinary melanocytes. This study supported the neural origin of blue nevus. Another case of an unusual adnexal lesion and concurrent collections of dendritic melanocytes of the type occuring in a blue nevus in a mature cystic teratoma of the ovary was reported in 1993. To the investigators' knowledge, there had been no previous reports of benign skin adnexal tumors in an ovarian dermoid cyst. This rarity would indicate that the cutaneous adnexal tissue in a benign teratoma is not unduly prone to undergo further more-specialized secondary tumorigenesis. The combination of the three benign lesions was therefore probably purely coincidental. Although the incidence of ovarian benign mature cystic teratoma is a quite common benign germ cell tumor, the development of a benign blue nevus arising in the cutaneous ectodermal component of a teratoma is extremely rare. It represents the rare phenomenon of a benign neoplasm arising in another benign neoplasm. Fortunately, it has no adverse prognostic effect.